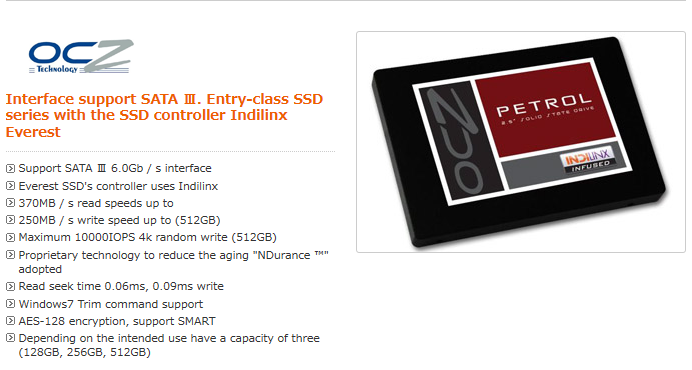 California-based hardware manufacturer OCZ has announced a new lineup of entry level SATA 3 SSDs known as Petrol. Alongside its previously revealed Octane Series, the 2.5-inch Petrol Series will be one of the first SSDs from OCZ to use controllers from Indilinx Everest. 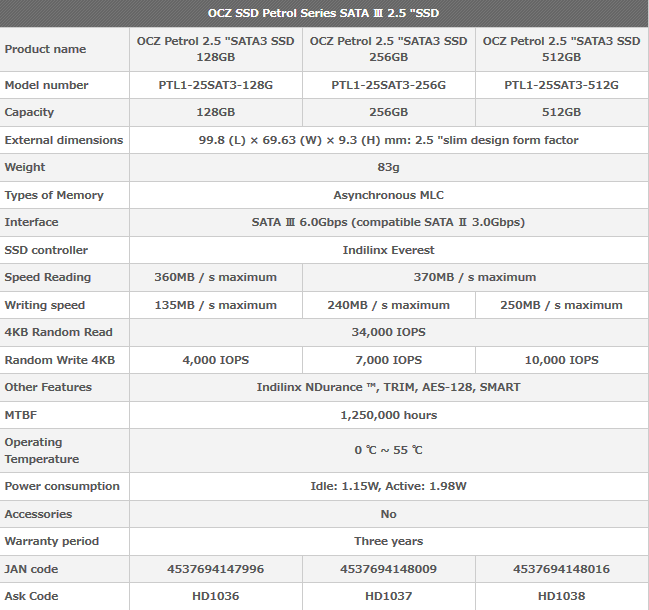 According to OCZ, the Petrol SSDs will have a bandwidth of up to 400MB/s, 35000 IOPS and access times of 0.06ms. “Until today, SSD adoption has been limited to high performance applications due to the high cost of SSDs in relation to slower rotating discs, and we are proud to once again close the gap in pricing without sacrificing durability,” said OCZ CEO Ryan Petersen in the press release. The Petrol Series will be available in the coming weeks in 64GB, 128GB, 256GB and 512GB drives with a 3-year warranty. According to Tom’s Hardware, the models are currently being listed for $113, $187, $396 and $803, respectively, but final prices are subject to change. See table below from TheSSDReview for more details on the new Petrol Series. 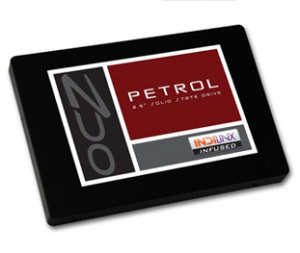 SAN JOSE, Calif., Dec. 13, 2011 (GLOBE NEWSWIRE) -- OCZ Technology Group, Inc. (Nasdaq:OCZ), a leading provider of high-performance solid-state drives (SSDs), today launched the Indilinx Everest-based Petrol SSD Series. The Petrol Series enables further adoption of SSDs in cost-sensitive applications, while taking advantage of real world performance and complete feature set of the Indilinx Everest platform. Founded in 2002, San Jose, CA-based OCZ Technology Group, Inc. (OCZ), is a leader in the design, manufacturing, and distribution of high performance and reliable Solid-State Drives (SSDs) and premium computer components. OCZ has built on its expertise in high-speed memory to become a leader in the enterprise and consumer SSD markets, a technology that competes with traditional rotating magnetic hard disk drives (HDDs). SSDs are faster, more reliable, generate less heat and use significantly less power than the HDDs used in the majority of computers today. In addition to SSD technology, OCZ also offers high performance components for computing devices and systems, including enterprise-class power management products as well as leading-edge computer gaming solutions. For more information, please visit: www.ocztechnology.com. Certain statements in this release relate to future events and expectations and as such constitute forward-looking statements involving known and unknown factors that may cause actual results of OCZ Technology Group, Inc. to be different from those expressed or implied in the forward-looking statements. In this context, words such as "will," "would," "expect," "anticipate," "should" or other similar words and phrases often identify forward-looking statements made on behalf of OCZ. It is important to note that actual results of OCZ may differ materially from those described or implied in such forward-looking statements based on a number of factors and uncertainties, including, but not limited to, market acceptance of OCZ's products and OCZ's ability to continually develop enhanced products; adverse changes both in the general macro-economic environment as well as in the industries OCZ serves, including computer manufacturing, traditional and online retailers, information storage, internet search and content providers and computer system integrators; OCZ's ability to efficiently manage material and inventory, including integrated circuit chip costs and freight costs; and OCZ's ability to generate cash from operations, secure external funding for its operations and manage its liquidity needs. Other general economic, business and financing conditions and factors are described in more detail in "Item 1A -- Risk Factors" in Part I in OCZ's Annual Report on Form 10-K filed with the SEC on May 17, 2011, and amended on May 31, 2011, and statements made in other subsequent filings. The filing is available both at www.sec.gov as well as via OCZ's website at www.ocztechnology.com. 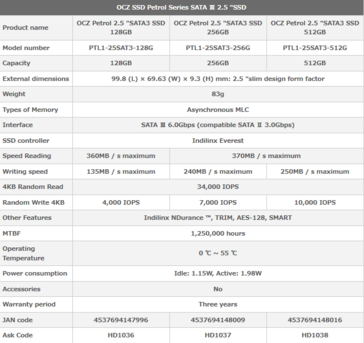 OCZ does not undertake to update its forward-looking statements.